Join the discussion on our forums! Come discuss Darkshire Alchemist over in our dedicated Darkshire Alchemist discussion topic. I just bought the Secret ingredient from an undead guy in Undercity! She needs to take some phonetics classes because she struggles with pronouncing "ichor". Not too sure how she pronounce "ichor" incorrectly though. It's pronounced with [ai] instead of [i] according to all the dictionaries I've looked through. Came here just to see if anyone else caught that. One of my peeves. This card is great. It is not broken, but it just does a thing you really want to do every game, and it's stats are super solid. You combined "is crying in the corner" and "cries in the corner" m8. Liking the non-pink/purple priest art! Good card, staple for priest maybe? replaces the walrus and healbot. 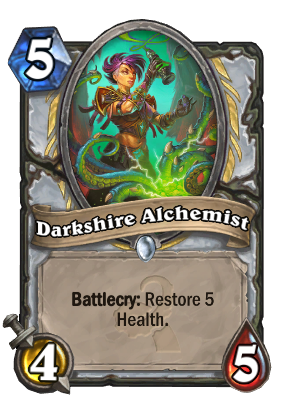 Going to see a lot of play, because Blizzard seems to be making a REALLY hard push towards control priest being the only priest with the lack of any early game cards.